U.S. Senator Kay Hagan, a North Carolina Democrat expected to face a tough battle to retain her seat in 2014, on Tuesday asked U.S. Attorney General Eric Holder to review a restrictive new state voting law championed by Republicans that she said will undermine the right to vote in her state. In a letter to Holder, Hagan said she was “deeply concerned” that the new law, which includes a requirement that voters bring photo identification to the polls, will deny voting rights to minorities, young people, the elderly and the poor. “Protecting the fundamental right of our citizens to vote should be among the federal government’s highest priorities,” Hagan wrote. On Monday, North Carolina Governor Pat McCrory, a Republican, signed into law sweeping new election reforms, making his the first state to enact new restrictions since the U.S. Supreme Court struck down parts of a Civil Rights-era law designed to protect minority voters. Opponents argue that because the affected voters tend to vote Democratic, the law was designed to bolster Republican success at the polls. But supporters say it eliminates voter fraud and standardizes elections across the state. The law also includes measures that reduce time allowed for early voting, eliminate voter registration on election day, ban student IDs from being used at the polls and shut down a program that pre-registered 16- and 17-year-olds to vote. 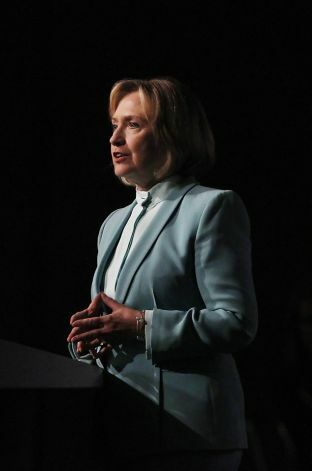 It will not go into effect until 2016, which means it will not affect Hagan’s race, the outcome of which could help determine whether Republicans or Democrats hold a majority in the U.S. Senate for the last two years of President Barack Obama’s term. Holder has threatened federal government action against states that seek to curb voting access in the wake of a U.S. Supreme Court ruling that struck down part of the Voting Rights Act of 1965. The section required states in the U.S. South with a history of racial discrimination, including North Carolina, to meet certain tests of fairness in voting. Late on Monday, the NAACP, the civil rights organization, brought a lawsuit challenging the law. The challenge is on behalf of a 92-year-old woman who was one of the first African Americans to vote in North Carolina, said Penda Hair, co-director of the Advancement Project, a national civil rights organization that partnered with the North Carolina NAACP to file the suit. Due to an issue with the photo ID, the woman, Rosanell Eaton, may not be able to vote under the new law after seven decades of voting legally, Hair said. More than 70 percent of African Americans who voted in the last North Carolina election did so through early voting, and African Americans are more likely to use same-day registration than are white voters, she said. “Lawmakers have failed to offer any credible, non-discriminatory reason for eliminating these popular programs, which had made voting more accessible for thousands of voters,” she said. The American Civil Liberties Union, the ACLU of North Carolina Legal Foundation, and the Southern Coalition for Social Justice have also sued. State Representative Harry Warren, one of the bill’s Republican sponsors, dismissed the accusations of racism, saying they were a political tactic and would fail. The law passed the Republican-controlled North Carolina General Assembly in late July, two years after Republicans took control of the state legislature for the first time in more than a century. Ten states have already enacted laws that require photo identification to vote, according to the National Conference of State Legislatures, and North Carolina is among a dozen states that have considered or adopted new laws this year. Republicans took control of the North Carolina Legislature in 2010 for the first time since Reconstruction and cemented full control of state government with the election of Republican governor Pat McCrory in 2012. 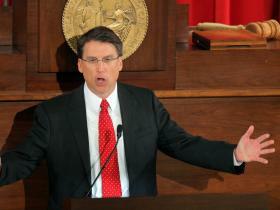 McCrory is also the first Republican governor of North Carolina in 20 years. 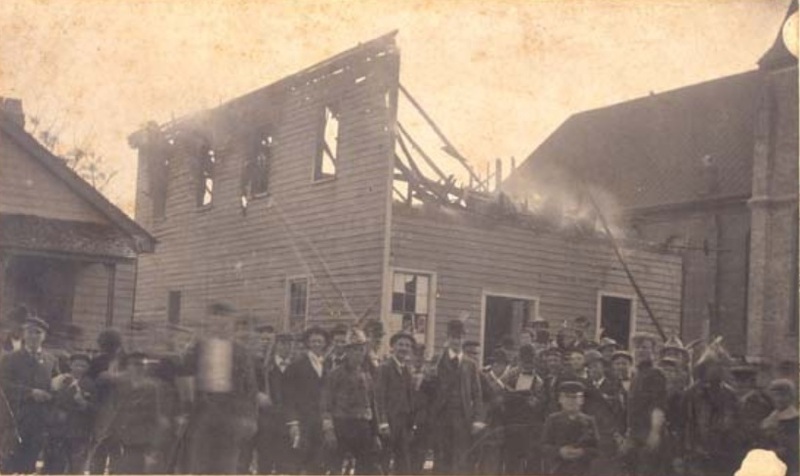 On November 10, 1898, Wilmington Insurrection of 1898 (Wilmington Massacre of 1898) took place, which became a landmark in North Carolina history. Restrictions on African-American voting followed, marking the onset of the Jim Crow era of segregation. 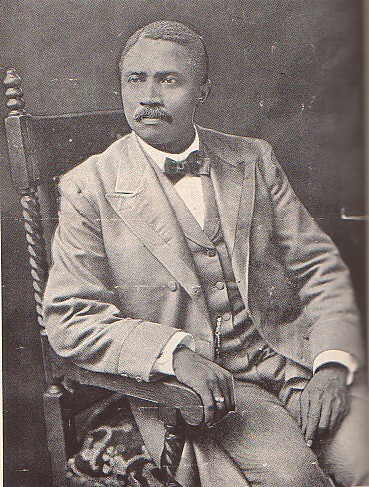 In 1898 Wilmington was the largest city in North Carolina and had a well off black population who owned many of the businesses in the central city. 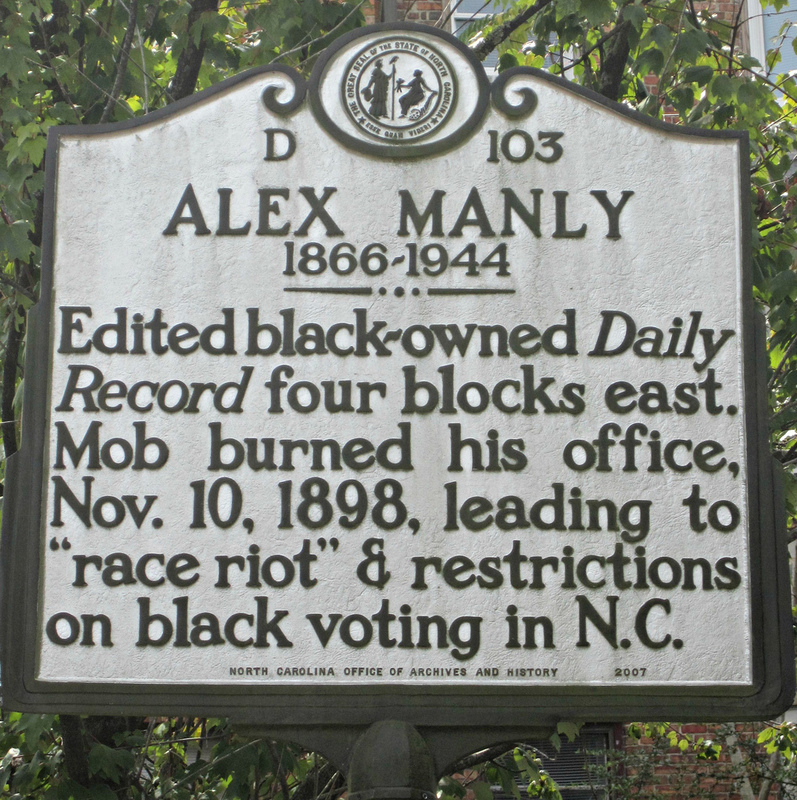 On a November day in 1898, a group of White Supremacists, led by Civil War luminary Colonel Alfred Waddell, burned down the offices of local newspaper, the Daily Record, the only major city newspaper in the country own by an African American, and overthrew the legitimately elected local government of Wilmington, which included many African Americans. 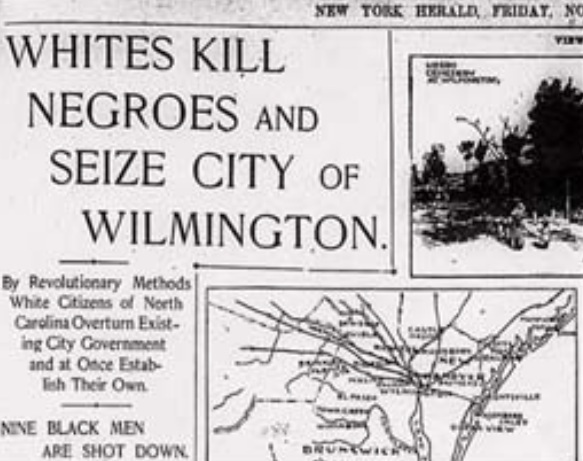 As the mob of white men swelled to 2000, the leaders confirmed their intention to fulfill Waddell’s mission to shoot every black man or woman they came across until they “choked the current of the Cape Fear River with carcasses.” Hundreds of black citizens fled to nearby swamps to hide. 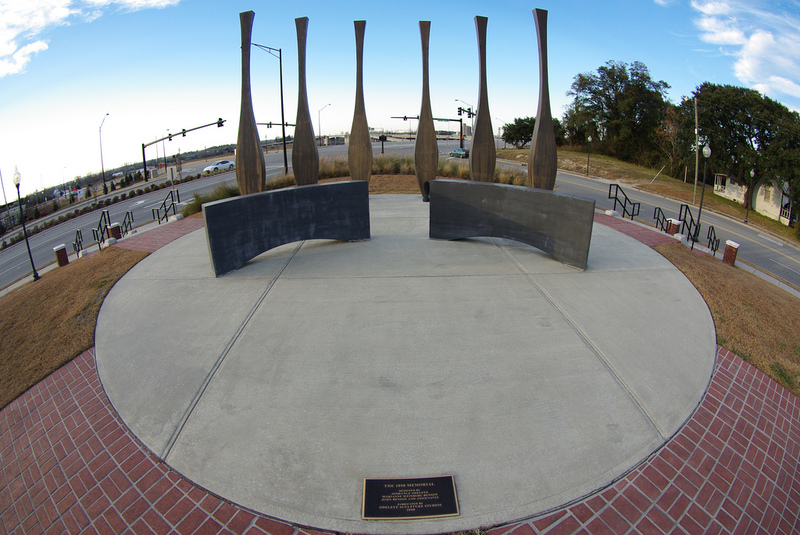 Ultimately, thousands of black residents left the city of Wilmington permanently, turning Wilmington from a black-majority to a white-majority city. As this was never investigated or prosecuted, there is no official death toll. In 2010 Wimington had a population of 73.5% White, 19.9% Black/African American. George Henry White, Republican U.S. 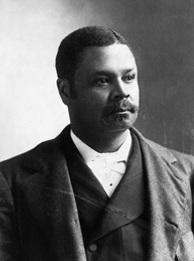 Congressman from North Carolina between 1897 and 1901 was the last African American Congressman elected before the active use of Jim Crow laws. After White left office, no other African American would serve in Congress until Oscar De Priest was elected in 1928, from Chicago. No African American was elected to Congress from North Carolina until 1992. Barbara Jordan was the first African American elected to the Texas Senate after Reconstruction, the first southern black female elected to the United States House of Representatives and the first African American from a Southern state, along with Andrew Young, of Georgia, elected to the U.S. Congress in 1973.